Fresh Start Green Cleaning is a licensed and insured cleaning service based in Welland, Ontario, serving you in the Niagara Region since 2008. You can have Eco-Friendly cleaning at a ECOnomical price! We'll come give you a FREE cleaning service proposal tailored to your specific needs! No obligation! You deserve a Fresh Start using only Green Cleaning products! We use natural cleaning recipes. Most are homemade using things like vinegar, baking soda, essential oils. Any commercial cleaning products we use are certified by EcoLogo or EPA Design for the Environment. It is important to us to provide quality affordable service. We will match or beat any legitimate competitors quote! A legitimate competitor would be any licensed and insured company offering quality green cleaning. Quote must be presented in writing. 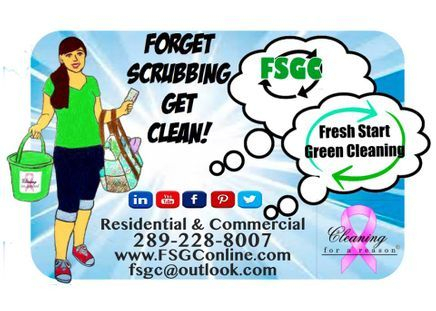 Fresh Start Green Cleaning understands that the security of your home and office is important to you. It's important to us too. You can have the peace of mind that we are a licensed and insured cleaning company, selective with the people we choose to hire, and we have police checks on file for our employees. It's also comforting to know that your cleaning is not polluting the environment with harmful chemicals. Fighting cancer is difficult enough, but living with it is even tougher and that’s where Cleaning For A Reason steps in. 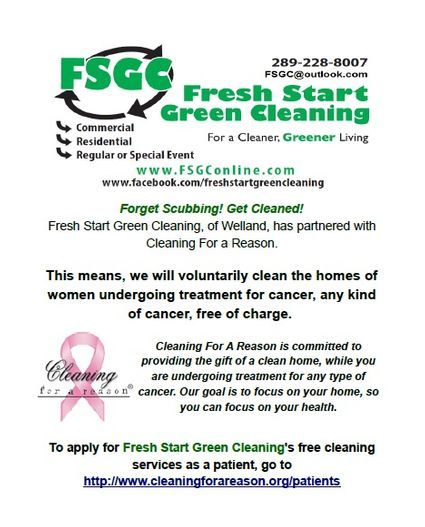 As a nonprofit serving the entire United States and Canada, they have partnered with maid services across the countries to offer professional house cleanings to help women undergoing treatment for cancer, any type of cancer. 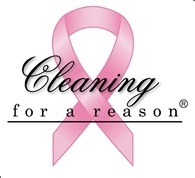 Cleaning For A Reason is committed to providing the gift of a clean home, while you are undergoing treatment for any type of cancer. Our goal is to focus on your home, so you can focus on your health.